Insomnia is defined by regular sleeplessness, or the inability to fall asleep. For optimum functioning, the body requires a certain amount of sleep each night; the absence of which can have drastic mental and physical consequences. During puberty, pregnancy, postpartum (including breastfeeding) and menopause, significant hormonal changes take place in a woman's life, which can cause sleep disturbances, including insomnia. There are, however, a number of changes that a woman can make in order to decrease the impact of insomnia in her life. Continue reading to learn about insomnia, and the causes, risk factors, symptoms, signs, prevention and treatment options available. Approximately 50% of adults experience acute (short term) insomnia, and as many as one in ten describe their condition as being chronic. 67% of women claim to lose sleep during their menstrual cycle every month. Insomnia is twice as common in women as in men, and reports of insomnia increase with age. People who are separated, divorced or widowed tend to report higher cases of insomnia than those who are married. Also people with lower socioeconomic status tend to report more cases of insomnia. Insomnia is characterized by difficulty falling asleep or staying asleep at least three times a week, for a period of one month or longer. Women with insomnia can also wake up frequently at night and be unable to return to sleep, wake up too early in the morning, or have sleep that is non-refreshing, leaving them feeling exceptionally tired throughout the day. Insomnia can cause impaired daytime functioning, lowered productivity and impaired motor abilities. It varies in cause, severity and duration for each individual person, and may come and go, where one will have periods of regular, restful sleep in between bouts of insomnia. Different people need different amounts of sleep, so insomnia can be measured not by the number of hours a person sleeps, but by the quality (or lack thereof) of sleep achieved. 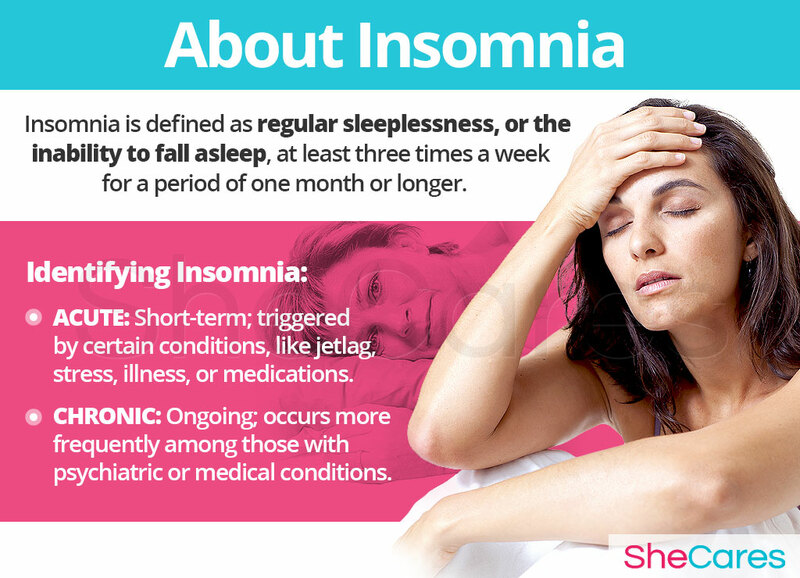 Insomnia can be separated into two distinct categories which are as follows; acute insomnia, and chronic insomnia. Acute insomnia is short term, and chronic insomnia is ongoing. Acute insomnia is often triggered by certain conditions, such as jetlag, stress, illness or medication. Chronic insomnia occurs more frequently among people with existing psychiatric or medical conditions. Insomnia is usually the symptom of a greater problem, such as hormonal imbalance, anxiety or depression. 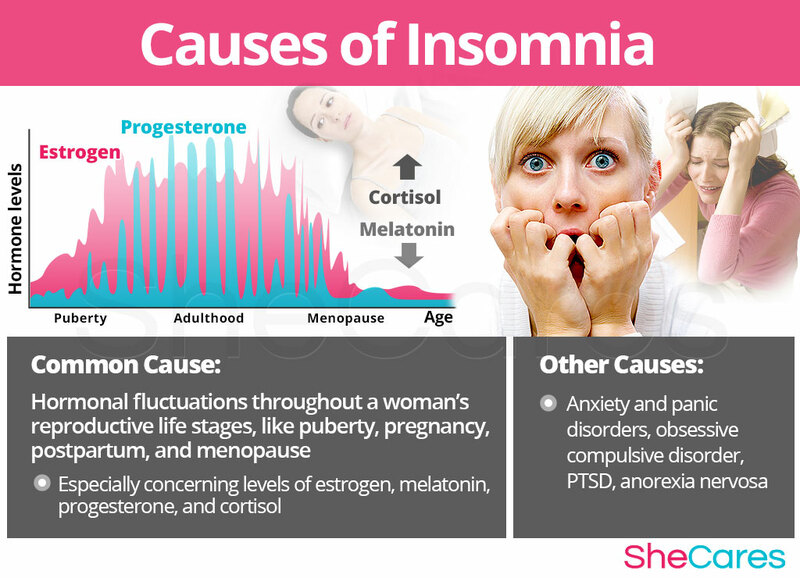 Brief periods of insomnia can coincide with female hormonal changes. Read on to discover the hormonal causes of insomnia. Hormones regulate a variety of bodily functions, like growth, sexual reproduction and brain function. A fine balance of hormonal levels is required in order for the body to operate as intended, though congenital and external factors can cause a shift in this balance. Thus, higher or lower levels of certain hormones can cause sleep disturbances. Estrogen. During puberty, pregnancy, postpartum and menopause, estrogen levels in a woman's body are fluctuating, which can interfere with the ability to achieve and maintain a good night's sleep. Melatonin. Receptors for melatonin, the 'sleep hormone,' can be found in the same area of the brain as those for estrogen. When there is a change in estrogen levels in the body, due to conditions like PMS or menopause, melatonin is automatically affected, and there is a greater chance that sleep disturbances or insomnia will result. Progesterone. Research has found that progesterone is linked to gamma-aminobutyric, or GABA, a neurotransmitter in the brain, related to the regulation of anxiety and sleep. GABA has a calming effect on the nervous system, which makes the transition to sleep easier. When there is an absence of progesterone in the body, GABA cannot work properly, and sleep may be disrupted or non-refreshing. It may be necessary to make lifestyle changes, or take supplements to decrease the effects of hormonally induced insomnia. Before treatment, it is important to be sure about what is causing insomnia. Read on to learn about the other causes of insomnia. Although hormonal imbalance is one of the main causes of insomnia during a woman's reproductive life, the root causes at each stage of development vary. For example, during puberty, insomnia tends to be caused by something different than that during menopause. There are also specific hormonal causes according to the stage of a women's reproductive life in which insomnia appears. These specific hormonal causes, along with other factors, can influence a woman's individual experience of dizziness, as identified below. During puberty girls become fertile, which means that the body begins to produce the fertility hormones, estrogen and progesterone. This hormone production increases gradually, which can sometimes cause dizziness. Pregnancy leads to extreme changes in the production of reproductive hormones, which along with other factors, like fatigue or bodily changes, can lead to insomnia. Postpartum and breastfeeding is another stage where reproductive hormones are imbalanced, leading to symptoms like insomnia. Also, other factors contribute to insomnia in postpartum, like postpartum depression. Menopause is the time in a woman's life when hormone production begins to naturally decline, signaling the beginning of infertility. Beyond hormonal causes, there are different factors in a woman's life during this time that can contribute to the cause of insomnia. 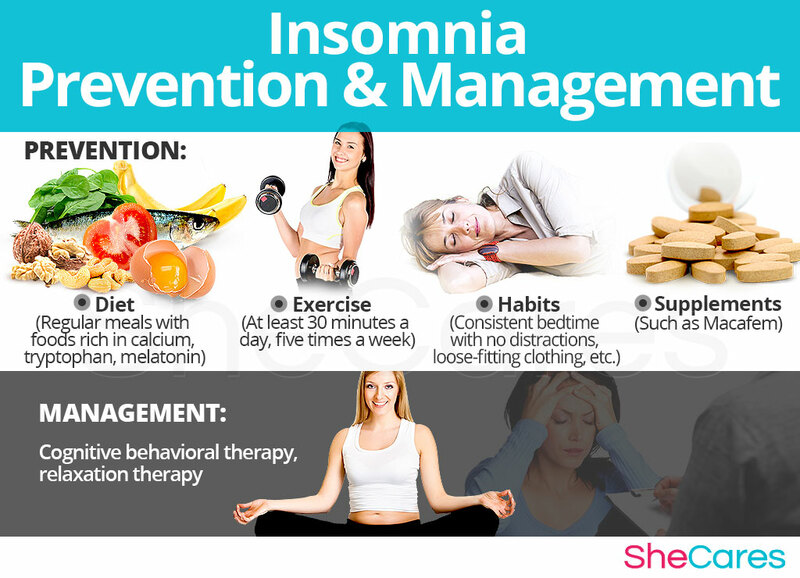 Some other causes of insomnia that are not related to hormonal imbalance are; anxiety and panic disorders, obsessive-compulsive disorder, post-traumatic stress disorder, and anorexia nervosa, as well as alcohol and drug abuse. Although insomnia may occur naturally in periods throughout a woman's life due to a shift in hormones, it can also signify a more serious condition. For more information about when to seek help for insomnia, keep reading about the symptoms of anxiety and panic disorders, obsessive compulsive disorder, post traumatic stress disorder and anorexia nervosa. Although the most likely cause of insomnia for women is hormonal imbalance, some women are more at risk of developing insomnia than others. Keep reading to learn more about the risk factors for insomnia. 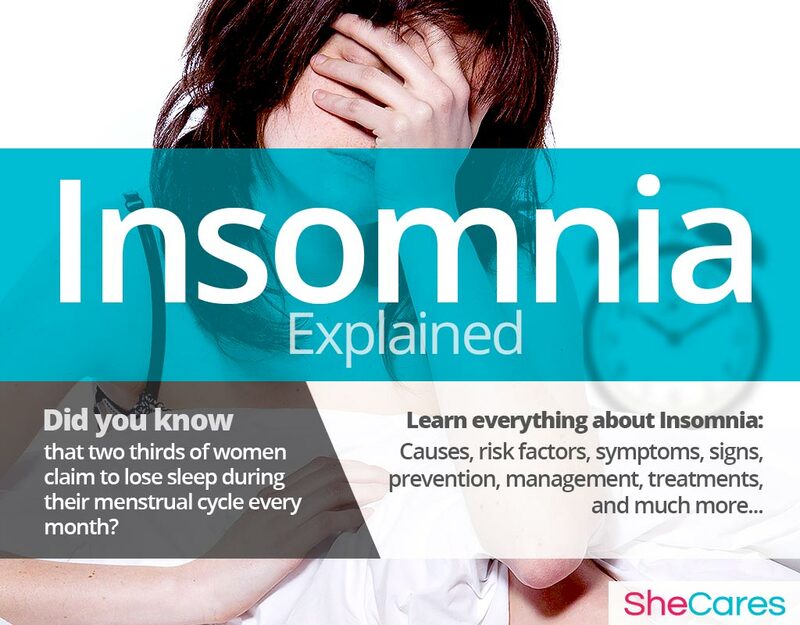 Some women are more likely than others to suffer from insomnia for inherent psychological, behavioral and health reasons. 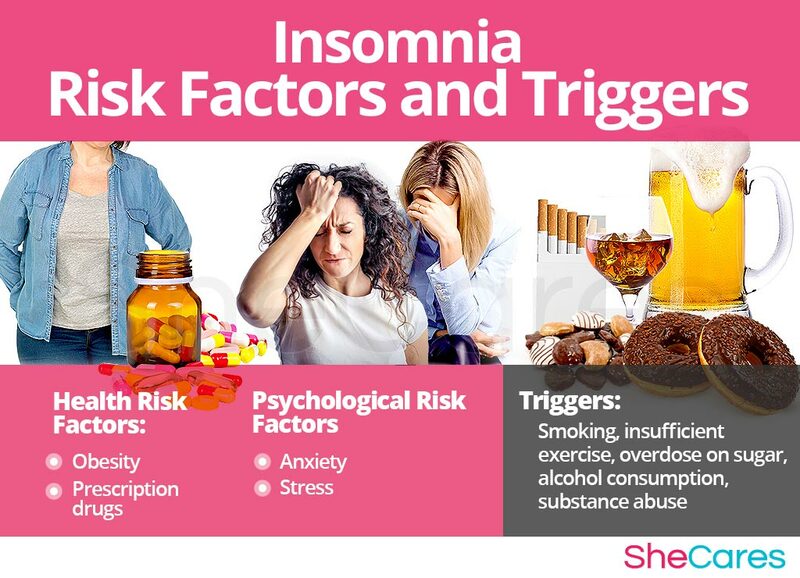 These predisposing factors can affect a woman's hormone levels and increase the chances that a woman will develop insomnia during her reproductive life. In addition to long-term risk factors, insomnia can also be triggered by other more controllable habits and environments. Avoiding these habits and better managing one's reaction to these unhealthy environments may help to decrease the onset of insomnia symptoms. It's important to recognize and understand the specific signs and symptoms of insomnia, in order to select a treatment specific to its cause. Continue reading to learn more about the signs and symptoms of insomnia. There are many medical signs and symptoms that can help to identify insomnia. Continue reading to learn more about the medical signs and symptoms of insomnia, as well as what to expect during a formal medical assessment. Beyond the physical symptoms of insomnia, there are also medical indicators that may not be as obvious, and can be assessed by a doctor or healthcare professional. Estrogen levels. Estrogen can cause hormonal imbalances, particularly during puberty, pregnancy, postpartum and menopause. 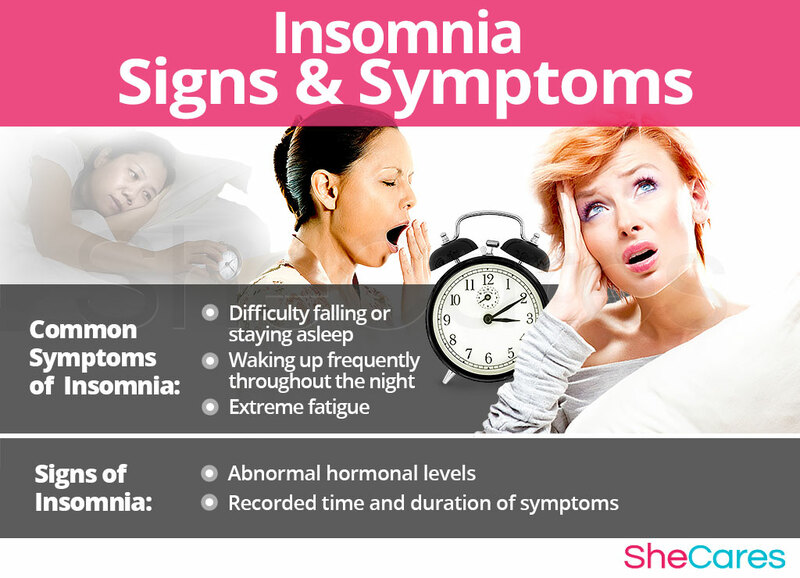 The fluctuating levels of estrogen in a woman's body during these periods may result in insomnia. Time and duration of symptoms. It may be helpful to monitor and record bouts of insomnia, including when it occurs, how many nights it occurs, as well as food consumed and stress levels that day. This may help to establish a pattern, such as insomnia occurring when a woman has had an excessive amount of caffeine, encountered a stressful situation at work, or during menstruation. If insomnia is uncontrollable, or may be caused by something other than hormones, it is advised to consult a physician, who can perform tests in order to properly treat the individual case. Keep reading to learn more about insomnia diagnosis and tests. A doctor will perform three procedures in order to diagnose and identify insomnia. They will review the patient's medical history, conduct a physical exam and finish with a psychological evaluation. If necessary, additional tests may be ordered. Following the initial assessment, further tests may be required. Continue reading to learn more about the possible complications of insomnia. Insomnia indicates a state of hyperarousal, meaning that the body is in a state of heightened physiological and psychological stress. Thus, instead of naturally being able to slow down the body and mind, drifting into sleep with relative ease, someone experiencing insomnia is unable to do so. It may take mental exercises, alternative treatment or drugs in order for them to achieve a good night's sleep. The body requires a sufficient amount of sleep in order to function properly. When sleep is severely lacking, it can create disturbances in mood, problems with relationships, extreme fatigue, and an overall reduced quality of life. Beyond extreme sleepiness, it can pose serious threats to a person's well being, as increased alcohol consumption and risk of automobile accidents have been linked to insomnia. Complications including cancer, weight gain, diabetes, heart disease and Alzheimer's have all been linked to poor sleep patterns, why is why addressing difficulty sleeping and identifying the root of the problem is essential, at the earliest stages possible. Keep reading to find out more about preventing and managing insomnia. Fortunately for sufferers of insomnia, there are a number of behaviors that serve to prevent and best manage the condition. Diet, use of supplements, habits and exercise can all help to lessen the effects of insomnia. There are several coping strategies for people experiencing insomnia, and the same strategies can be used on both acute and chronic cases. It is important to treat any instance of insomnia and discover its cause because even mild cases, if left untreated, can lead to future disturbances in sleep patterns. Continue reading to learn more about insomnia treatments. The treatment of insomnia, whether acute or chronic, is essential in order to prevent it from becoming an ongoing problem. A patient may be referred to a sleep center for special tests, which often involve spending the night and being attached to monitors. The three ways to treat insomnia are (1) Lifestyle Changes, (2) Alternative Medicine and (3) Pharmaceutical Options. It is always recommended to start with the first line of treatments, which tends to be the least expensive and invasive, but often involves the most self-discipline. Start by keeping a sleep journal to log sleeping patterns, moods, foods consumed before bed, and any other relevant details. If lifestyle changes alone are not effective in decreasing the intensity or frequency of insomnia, it may also be beneficial to incorporate alternative treatments into the daily routine. Alternative medicine involves minimal risk, and can be an effective way to manage insomnia. There are two different types of herbal supplements that can be used; phytoestrogenic herbs, and hormone-regulating herbal supplements. These supplements, such as black cohosh, contain estrogenic components produced by plants that complement the low estrogen hormones in a woman's body, helping alleviate insomnia. By introducing plant-based estrogens into the body, these herbs treat the underlying estrogen deficiency behind insomnia. Supplements like these can be considered the safest and most natural way to treat the underlying hormonal imbalance causing insomnia, and can be taken throughout a woman's life, as they support the body's natural hormone production. If neither lifestyle habits nor alternative treatments provide any relief from insomnia symptoms, it may be necessary to take drugs recommended by a healthcare professional. Treatments at the third level involve the highest risk, and also the highest costs. This option should only be considered if lifestyle changes and alternative medicines have proven ineffective. Sedating anti-depressants, benzodiazepines and zolpidem are common drugs used to treat insomnia. 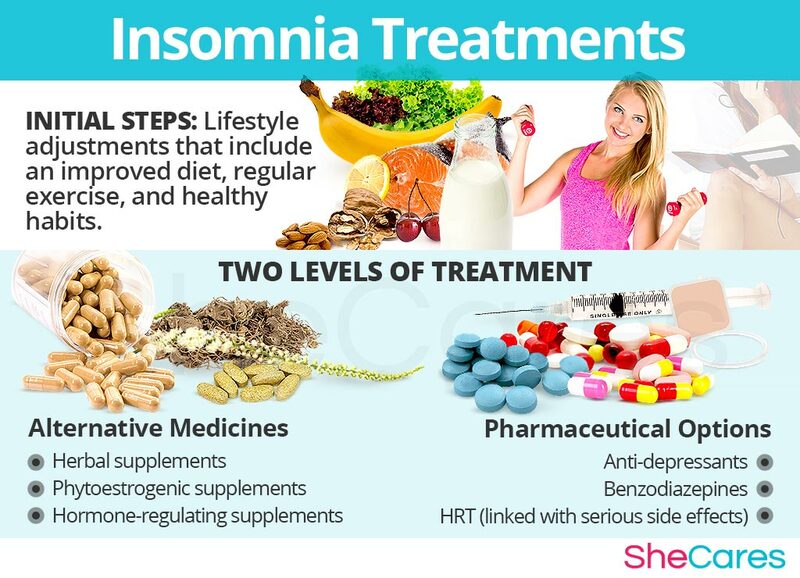 It is important that any insomnia treatment drugs are used exactly as prescribed, because some are meant for short term use, and others long term, and some can be habit forming. A combination of alternative therapies and drugs seems to be the most effective solution to cases of chronic insomnia. Side effects may occur as the result of taking any drugs. It is recommended to take drugs only when necessary, and under the advice and monitoring of a healthcare professional. http://www.ncbi.nlm.nih.gov/pubmed/23221728 Sleep disturbance and the incidence of thyroid cancer in postmenopausal women the women's health initiative.